Posters featuring mosaic images of poppies made up of the faces of Sandwell people have gone on display to commemorate the 100th anniversary of the end of the First World War. 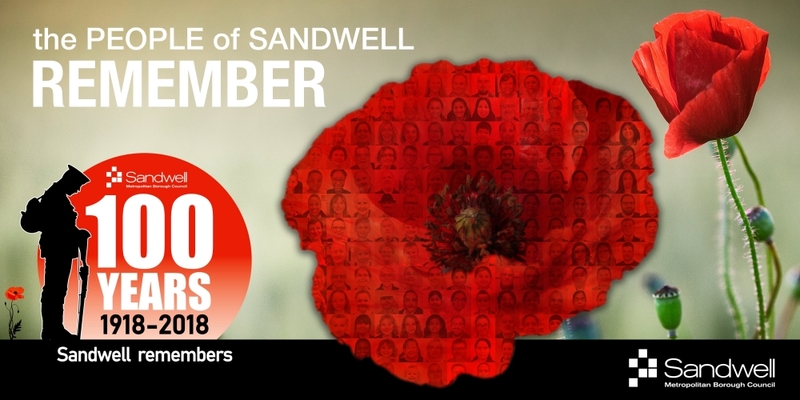 The images can be seen on more than 50 poster sites and billboards around Sandwell with the strapline ‘The people of Sandwell remember’. Sandwell’s museums, libraries and archives teams invited people to submit selfies or have their photo taken for the project. A selection of these photos has been used to create several different poppy images. The poppy mosaic posters have also been sent to 1,500 addresses which were the homes of the next-of-kin of some of the many men from Sandwell who were killed in the Great War. The council is encouraging current occupants of these addresses to display a poster in remembrance. Sandwell Council Leader Councillor Steve Eling said: “This is a very creative and visual way for Sandwell people today to show their gratitude to those who paid the ultimate sacrifice. I would like to thank everyone who has taken part. More than 5,000 men from within the borders of what is now Sandwell died during the war or later from their injuries. Go to our Sandwell Remembers webpage to find out how Sandwell is commemorating the centenary of the end of the war.